Our 1,000 camera solution leverages Xcellis Workflow Director and QXS-456 Storage for 30 days of online retention. For 1 year additional retention, utilize the option to add a second tier of storage consisting of a Scalar i6000 LTO tape library, or combine the uses of an off-premise FlexTier cloud access solution for unlimited retention capabilities. 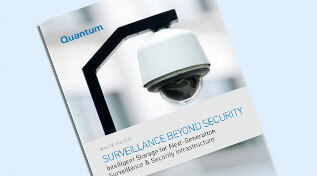 Traditionally in surveillance and security systems, storage solutions have had to tradeoff between cost, manageability, reliability, and performance. Acquiring a storage system that had the performance needed was very expensive and often very difficult to manage. With less-expensive storage systems, performance was often inadequate and the reliability questionable. Having a storage system that was high performing, highly reliable, easy to manage, and securely expandable while staying within budget was seen as a pipe dream. That is, until now. Scalar® libraries are the intelligent choice for surveillance and security professionals looking to archive video that requires long-term data retention. Proactive and automated monitoring and management reduces administration time and service interruptions, keeping IT staff focused on key business objectives. FlexTier can be incorporated with security and surveillance professionals’ pre-existing cloud configurations, extending their storage capacity when experiencing an increase in data. FlexTier allows customers to “bring their own cloud” and was designed to support flexible and short-term storage requirements for security and law enforcement professionals who want to access additional capacity on a moment’s notice without capital expenditure or infrastructure deployments. FlexTier is a universal connectivity management tool to be leveraged with StorNext. It supports immediate access to video with no bandwidth restrictions. Whether you’re taking on new body camera video, CCTV infrastructure is growing faster than expected, or building out a new security initiative, FlexTier offers storage flexibility that eliminates capital expenditure, data center space and cooling, and admin costs.